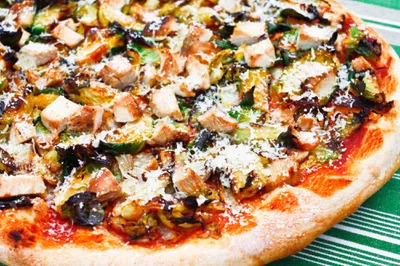 Making your own pizza at home is a great way to slash calories and fat as well as add some serious flavor and nutrients by selecting your own fresh toppings. Even still, a homemade pizza can still wreck your diet if you're not careful. Here are some easy ways to slim down your slice! The sauce isn't usually the first thing I think about when I am making homemade pizza, but it's an important part of the pie. A flavorful sauce with fresh herbs and spices will add a ton of flavor to your pizza, so you won't need to load up on cheese and other high-calorie toppings to fully enjoy it. Not all cheeses are created equal, so try experimenting with some lower calorie and reduced fat options, such as goat cheese or crumbled feta, which are not only less oily than traditional mozzarella, but they taste just as good--if not better! And, of course, you can always use less cheese or go cheese-less on your pizza. Pizza without cheese is no fun, but the majority of the calories and fat come from this ingredient. Instead of piling on the cheese, divide your crust in half and only add cheese to one side. Have a slice from each half, so you can enjoy the best of both worlds while balancing your diet at the same time. Still missing the cheese? Sprinkle grated Parmesan on the sauce-only side. Toppings make or break your pizza pie, so pile on fresh produce (veggies and fruit), herbs, and spices for the maximum amount of flavor for a fraction of the calories. Some of my favorite additions: Brussels sprouts, pineapple, figs, apples, basil, rosemary, and curry. Sure, I love a thick, doughy pizza crust, but I know it's not friendly on the waistline, so I often enjoy pizza with a thinner crust. I still get all of the delicious taste of a regular pizza-- cheese, sauce, and toppings--but without the added calories from a thick crust. Divide store-bought dough in half for two thin crust pizzas instead of one thick crust or use pitas/tortillas for an even thinner crust.